Fausto: [as they leave a car and go into a building to a party] 20 minutes, hello, good-bye. This movie was great and enjoyable back in 1991 and still is so even today. There is just that something unique about the chemistry between comedians Dan Aykroyd, John Candy and Chevy Chase. The story is about four upscale people whom are caught for traffic violations in Valkenvania and are brought for immediate sentencing before the eccentric judge Alvin Valkenheiser. And soon the day turns into a real nightmare. 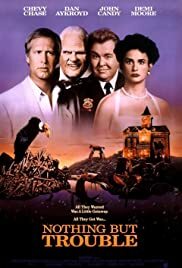 While "Nothing But Trouble" is not the type of comedy that will split you open from excessive laughing, then there is just something Classic about the entire movie; be it the mood and absurdity of the story, the hilarious and outrageous characters, or the fact that Dan Aykroyd, John Candy and Chevy Chase were just a great combination, I do not know. But I do know that this movie is entertaining. The movie does bear itself as watchable more than once. 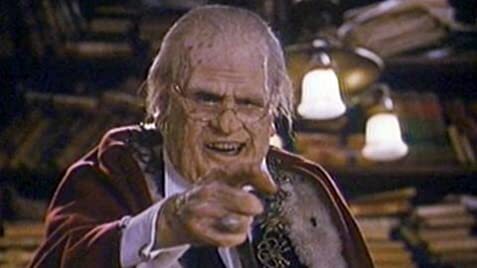 And if you are a fan of Dan Aykroyd, John Candy or Chevy Chase, then "Nothing But Trouble" is a must watch.